Softies are simple sewing projects that can be stuffed with poly-fil. They are anything from super easy to more complex creations. This Sew-a-Softie project started as an initiative to encourage young people and adults who have never sewn that sewing is easy and fun. It was started in Australia by Trixi Symonds who was recently featured in the magazine, Creative Machine Embroidery. 2016 was the debut of this international event and this year it has evolved into a month long affair. There is a dedicated website at www.sewasoftie.com and a Facebook group - Sew a Softie. You will want to follow "Sew a Softie" on your Facebook account as there will be a great giveaway, or follow the Sew a Softie blog for a chance at the giveaway. Click here is a list of all the items on the giveaway list . There is a roundup of crafty people coming together to share their talents for this project. Below is a list of the first 15 days of the roundup. Please click on their website on their day to see what they have designed just for you. You will not want to miss Mollie's adorable alpaca today. Llama's and alpacas are the rave lately. Have fun sewing and if you can, teach someone else to sew too. The best sewing projects are when they are done together with a friend. A friend of mine texted me, and asked if I would help her reestablish her sewing skills by making pillowcase dresses for her daughters. Oh, I loved the idea – fellowship and sewing – it does not get any better than that. Pillowcase dress on the sweetest girl with a matching purse and rosettes made by her mom. Simplicity has a pattern designed just for pillowcase dresses. Pattern 2391 sounded like it was just perfect for her first project in several years. We started out by perusing the pillowcases, the pattern, and finally finding dresses that were a good fit and length for the girls, so we could use them as a guide, since the girls were in school and we could not measure them. After scanning the pattern and the instructions, I decided that view A and C were best, as they did not have the bottom band and I cut it out the front piece quickly. We measured the front piece with the girls’ dresses and then with the pillowcases to make sure that it all fit. The pattern uniquely has two instructions – one for fabric dresses – one for true pillowcase dresses. We opted for the dress made from a pillowcase. My friend had purchased them so inexpensively and that was her goal with a pillowcase dress - inexpensive repurposed dress. STEP 2 – Fold the pillowcase lengthwise. Layout the dress on the pillowcase to determine the placement, width and length of the dress. Mark or otherwise indicate the top of the dress. STEP 3 – Place the armscye )sleeve opening) pattern or dress on the seams of the pillowcase, lining up the top with that of the top line that you measured in Step 2. STEP 4 – Cut the armscye and the top of the pillowcase straight to the edge of the fold. Notice that we had extra width compared to the pattern, but that was good and could be taken in when gathered by the ribbon. STEP 5 – With the leftover pillowcase fabric cut four 2 inch strips that are the width of the pillowcase (not the diameter – you can cut the seams so there are two widths when you cut). Two will be used for the bias binding on the sleeve openings (armscye). Two will be used for the casing on the neck for the ribbon. STEP 6 – Press two bias strips in half lengthwise. STEP 7 – Press the other two bias strips with a fold ¼” from the bottom. STEP 8 – Pin the bias strip that has been pressed in half to the sleeve opening on the right side. Cut any extra bias fabric at the end to match with the armscye. Do it for both armscyes. STEP 9 – Sew the bias strip to each armscyce using a ½” seam allowance. STEP 10 – Press the bias strip flat. STEP 11 – Trim the seam allowance to 3/8”. STEP 12 – Fold the bias strip down and sew it close to the edge. STEP 13 – Press the armscyes. STEP 14 – To make the ribbon casing, pin the other bias strip with the ¼” fold to the neckline and fold the ends in about ½” from the end. Cut any extra bias fabric at the end to match with the neckline. Do it for the front and back. STEP 15 – Press the bias strip flat – being careful not to loose the ¼” fold. STEP 16 - Fold the bias strip down and sew it close to the edge of the ¼” fold. STEP 17 – Press the neckline. STEP 18 – Cut the ribbon in half and thread each through the casing made at the neckline. Do this for the front and the back, then tie the ribbons together at the shoulders to finish the dress. My friend and I had a fun and productive morning together, but it was too short, so we decided that we needed to do it again soon. She would love to continue repurposing. What sewing projects have you sewn that are repurposed? Machine embroidering a garment is so much fun. You get the pleasure of both embroidering it and wearing it. Many of us just embroider to enhance premade garments, but on those special garments, we even break down and create the whole garment. We do not get to do as much embroidering, but for some of us, garment construction is as much fun (well…almost). Personally, I get extra enjoyment when I am embroidering for my family. My college daughter asked me to embroider her a Mexican flower peasant blouse, but after purchasing several patterns and fabrics, we settled on a tunic design. She chose Simplicity 4149 with the cap sleeves from Simplicity 1461. The fabric is a handkerchief weight cotton from Spechler-Vogel. Choosing the embroidery design was the easiest part. I just loved Embroidery Online's Flores de Mexico. It looks and sounds so authentic. Their color combination that they chose to stitch out is just beautiful with a rich turquoise. My daughter chose a bright and neon combination from Floriani that just pops and screams, "Young." It took me a little while before I had to courage to tackle this project as my daughter is a great machine embroider and I knew she would not be happy if the placement was not just right, but I also knew that if anyone would appreciate it, it would be her. The best strategy that I decided was to prep the fabric with all the necessary markings. When I purchased the fabric I did not have the foresight to buy extra since I knew it did not have a nap or a design. Next time I would definitely buy an extra half yard so I could put it in the hoop comfortably. Since I was right up to the edge on everything, I decided that I did not have any room for mistakes and would embroider with that mind set. All the other pieces were cut out and I left the front of the pattern uncut. I traced the front pattern with a blue chalk onto the fabric. I knew that after multiple hoping that the chalk lines would not remain and I was not sure if they would be visible to the sewing machine's camera, so I decided to baste the chalk lines with a red cotton thread. The seam allowance on the neckline was very important, as well as, the center front line and the placement for the front placket. In hindsight I needed the sleeve seam allowance also, so I wound up drawing them in when I was at that point. For me the biggest decision was what stabilizer to use. My daughter kept insisting that she wanted a wash away, but my I did not feel comfortable doing that with such a lightweight fabric combined with a heavy design. That was not a good mix in the first place. I practiced with a wash away and was not happy with it. She loves the convenience of the tear away, but I went against all her wishes and used the "No Show Mesh Nylon Cutaway Fusible Stabilizer" by Floriani. Of course, I was a smart mom and did not tell her what I used until she said she loved it. The stabilizer was applied to cover the entire area that was going to be embroidered, including the area where it would need to be hooped, but the fabric would not be in the hoop. Here is where I would have loved to have had those extra inches of fabric, but since the fabric was so thin, it would hoop so evenly and tightly that it would not even make a difference. My daughter loved the placement of the Embroidery Online tunic, so I tried to duplicate it as much as possible. After close examination, we determined that the main bottom center design was actually two designs stitched on top of each other. The camera and snowman feature of my Babylock Ellisimo Gold were lifesavers. Even in the placement of the first design I used the snowman first, then the camera, to make sure the placement was exactly matched up with all my stitching lines. Thankfully, it was right where I wanted it. I stitched the first design and then used the camera to find the placement of the second design. Presto! Right on the mark again. I cannot imagine having embroidered this project without that scanning feature. Most everything fit exactly as I had imagined it, with the exception of the sleeve area. The very end of the scroll goes into the seam allowance, but that was adjusted when I sewed by taking it just right to the edge of the scroll and right there is the best part about constructing your own garments instead of purchasing them to embellish. Which do you prefer to embroider on - ready-made garments or constructing your own garments? Our youngest son fell for the craze and asked if I would make him a mustache pillow for his room, which you can tell was a while ago since it is so faded, but those are the kind of requests that a mother jumps up and down about – teenage son asking to me to sew!!! It was done in a flash. When I was recently cleaning my sewing shelves, I noticed that I still had the pattern in my metal sewing box, so it was perfect for sharing with you this month. Hopefully, mustaches are still faddy enough for you to still enjoy. NOTES: 1. Pattern uses ½” seam allowance. 2. The quarter is for reference. Please make sure it is the same size as an actual quarter when you print the pattern. STEP 1 - Wash and dry your fabric because a pillow is always cuddled, so it will need to be washed eventually. Press if necessary. STEP 2 - Download the pattern above and tape the two parts together by connecting Part 1 with Part 2 by matching the 1A to the 2A and the 1B to the 2B. Then cut out the pattern on the cutting line. STEP 3 - Place the pattern on the fold of the fabric and cut two from the fabric. STEP 4 - Lay fabric with right sides together and sew with a ½” seam allowance leaving a 3” opening at one of the widest edges, but not in the middle or an end. STEP 5 - SPECIAL SEWING INSTRUCTIONS for the points – When you are about 3 stitches away from the point which will be a little over the ½” from the edge – STOP – change your thread stitch length to the smallest possible. Stitch half way from the starting point to the edge then pivot – STITCH 3 stitches – then pivot and stitch to same place that your started, but now on the other side – STOP – change your thread stitch length back to its normal position and proceed with sewing. DO NOT sew to the point of the mustache and then pivot. It will not make an accurate point. STEP 6 - Trim and clip corners and curves. STEP 7 - Turn right side out and press. STEP 8 - Stuff the pillow really full with stuffing, pushing it with a long bamboo stick into the points and around the corners. STEP 9 - Hand stitch the opening closed. STEP 10 - Enjoy and share on your social media. Remember if you share this pattern; please reference back to this blog post. What are you doing for National Craft Month? Machine Embroidered Greeting Cards or Just Stitched? Michael’s had a wonderful deal on gold-foil cards – 60 cards for $5. That is eight cents a card. You cannot get them that cheap anywhere! They are a very nice quality, not at all flimsy like I thought they would be. They looked very young and just what the girls would like. However, I wanted to take them to the next level – embroidered cards. Machine embroidering on paper was one of the first things that I tried when first received my machine. I am not sure why I was so intrigued that I put it above so many other fabulous features, but I did. I had hooped a piece of medium cut-away stabilizer, sprayed adhesive on the back of the paper and ta-da! It worked beautifully. Somehow, I had enough common sense not to use a dense design, so it did not cut through the paper and make it pop out like a cut-out. This summer, I was experimenting with the standard built-in stitches on my sewing machine, as I wanted to know which ones were compatible with the sewing machines that I was going to teach on at the Fairfield Library (also see Fairfield tag below). During that process, I played with the built-in alphabet characters. These are different from the actual embroidery characters, because they are generated using the utility function for stitches and the foot pedal. It does not use a hoop or an embroidery foot. It does not sew automatically, the foot pedal must be engaged and I must guide the fabric. This is truly a sewing function, not embroidery and yet they are alphabetical characters. These built-in alphabet characters are so much fun and they are so quick to produce a word and the best part is that they can be done without hooping or stabilizer. They were just what I needed to make these cards a little more personal. Besides, the birthday girl is the only one in the family who knows how to machine embroider and I know how much she loves machine embroidery. So the question is, what do you consider the built-in alphabets – embroidery or stitching? Re-purposing is so much fun and so green. It is so me. I love to use things that would normally be discarded and use them again, but it is even more fun when it is for your son. We are so proud of our oldest son who was a drone pilot in the Army. While he was in flight school someone made these embroidered t-shirts for them. He came home for a transition time to the civilian world and when he was preparing to move out, he asked if anyone wanted this t-shirt. My first response was to inspect the quality of the embroidery, the type of stabilizer and of course, the last stage trimming. You know, I gave it once over. Then I gave him a hard time because he told me that he would never wear an embroidered shirt. His come back was that he never did and said, “Mom, did you ever see me wear that shirt?” Well, okay, but I could not throw away someone else’s embroidery and a memento at that. The easiest solution was to make a pillow. To my surprise he loved the idea. The t-shirt surprised me though when I was planning what size pillow to make it. The design was really tucked in the upper corner, very close to the sleeve. A rectangle pillow would do the trick by offsetting it a little bit in the upper corner as planned; it would look like it was meant to be there. The embroidery needed as much room as possible so I used the rotary cutter and ruler to make the first cut as close to the neck as possible. Then I fussy cut the sleeves out. I could have cut them out first, but by leaving them in tack, allowed me to keep the shirt front and back straight and lined up for that first cut. After the sleeves came out, I cut down one side and cut the remaining three sides on the front and back. I could have cut the front with the back by keeping them together, but when I had measured I noticed two important things. First, that the back was larger than the front. Secondly, that the front was not going to make a 12” + 1/2” seam allowance by 16” + 1/2” seam allowance to fit the pillow form that I purchased. I decided to make the front as big as possible 12 ½” by 16” and add the extra seam allowance to the back. I knew that no one would notice that the seam was slightly pulled forward. The corners were rounded so this knit would not pucker when squared and it would give fullness where the polyfil was lacking, since it did not have the material for a flange or any other time of edging. This pillow was just to be used as an accent in his bedroom that was grey and with the t-shirt material so flimsy, I opted out of not using my standard zippered closure for a pillow. If the pillow was dirty, I just assumed that the pillow form would be too and it was small enough to wash the entire pillow in the machine. Of course, that was the first thing my son pointed out. “Mom, where’s the zipper?” Technically, that was a good response. It means we as sewers have done our job well when our family notices when we cut corners. What has your family noticed? Four days of sewing. What can you accomplish in four days? The teens at the Fairfield Woods Branch Public Library accomplished an incredible amount in the their four days. Most began with no sewing experience at all and by the the end of four days they had received their driver's license from the library's sewing studio and sewn four projects: rice heating bag, round cuddle pillow (so cute & soft), pajama bottoms, and small zippered bag. Many sewing techniques had been acquired to get to the point of being able to make these four projects. They had sewn straight seams, enforced faux serger seams, sewn with plaids, sewn with a napped fabric, hand sewn a button onto their pillows, sewed curves, clipped curves, sewn an elliptic casing, and then to finish they learned to sew a zipper. That is amazing in four short two hour days. The most amazing part of this fourth day was the way they all soaked up the project instructions with needing very little guidance. They could see it!! That is such a big part of sewing - being able to see how it is all going to work together. It is a practical puzzle. The zippered bags were made from repurposed blue jeans and men's dress shirts. The best! I love repurposing and these fabrics are a dream to work with - no slipping. We started out with 4 pieces of fabric that were 9 1/2" by 6 1/2" and we used a 1/2" seam allowance. The only cost involved was a 9", but the library had many of them donated and they purchased a roll of red zipper tape from eNasco. They are so economical when you need to buy in bulk. We also added an optional 1/4" red grosgrain ribbon for a zipper pull. The construction of the bag is so simple and you can see the instructions at The Purl Bee. While the idea and method were my own, as with all the projects, but he pillow, I wanted some clear pictures with instructions to provide the library when I presented my proposal. The clear explanation with pictures at The Purl Bee are great, just what I wanted. This bag is so versatile and can be used for so many things, but from what I heard from the teens, they will be using it as a pencil bag when they return to school. How will you use your bag now that you can create so many at relatively no cost? Day three of the sewing camp at the Fairfield Woods Branch Library was the most intense. The teens learned about patterns the day before and had actually cut out their fabric for pajama bottom shorts. There was so much to accomplish and they did it all so well. Pajama shorts look pretty easy, but believe it or not, the biggest obstacle is knowing which piece is the front and which is the back. Sounds so basic and simple, but from a quick glance it is hard to tell the difference. Upon careful comparison you can see that the back piece is slightly wider to allow for our derrieres. Then there is the issue of knowing what is the right side and the wrong side. 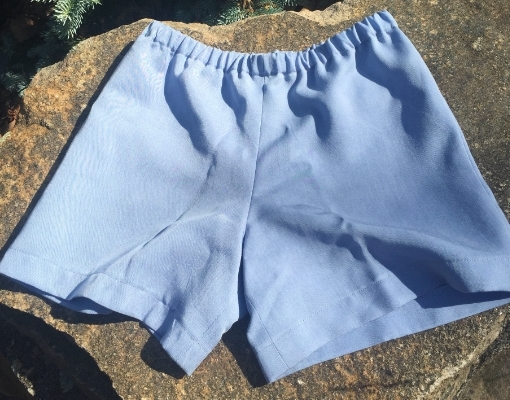 With many fabric choices this is not an issue, but our fabric was a soft cotton in a solid light blue that the right and wrong side could only be perceived when examined very closely. To combat both of these issues and because the pieces were cut the day before, I labeled them before the next class with four strips of blue painters tape: front left, front right, back left, and back right. The side that had the tape on it was the right side. This made the whole process so much easier and did not cause any confusion when putting them together. The teens concentrated hard on the challenge of keeping all those seams straight and within the seam allowance, to insure a proper fit and to make sure those elastic casings were not too narrow. These teens were awesome and were so industrious all day long. They were practicing to be so precise in everything that they did, including clipping those curves and pressing everything. Amazingly, no one complained that we did not finish them that day as planned. We gave them the option to come in an half hour early and to our surprise, some were so eager that they were there almost an hour before. What desire and motivation! Congratulations on a job well done. I am so incredibly proud of them. They worked hard and succeeded. Once you learn the basics of using a sewing machine, it is merely a matter of practice and learning new techniques, which is quite vast, but you can accomplish much with just the basics. However, the world of garment and other textile construction is quite complex. The sewing camp teens at the Fairfield Woods Branch Library progressed very quickly with respect to the types of fabric with which they sewed. Their first project involved plaids. For an experienced seamstress, she would never have considered plaids for a long time since they can be quit difficult to line up when cutting. To save the teens that anguish, we did the cutting for them. The flannel was so beautiful on both sides so we did not concern them with the right and wrong sides. We did the cutting and put the two pieces together in their kits so there would not be any chance of the plaids not being lined up. The second project was a plump round pillow made of cuddle material, also known as minky (minkee). This cuddle material was so soft and lush that it won their hearts with being their favorite project, but it was a challenge because it has a very deep nap. Once again, the library was blessed to have had this lovely fabric donated and there was no issue of cutting as the pieces were generous wide one yard cuts. The fabric choices were in lively modern colors of lime green and bright pink, with trendy designs of chevron, damask, stripes, paisleys, and dots. Just the cutest fabrics you could imagine. To overcome the obstacle of a difficult fabric and to allow the maximum amount of sewing time for the teens, we opted for cutting and pinning the two circles together. This guaranteed that the fabric naps were going in the correct direction. It worked perfectly. Now the teens could concentrate on sewing a circle. The pattern instructions were courtesy of Shannon Fabrics in CA. While the teens used this predominately, I did deviate when it came to cutting the fabric circles. I made a thick cardboard circle template with a pin, marker and a ribbon. I cut the ribbon the length of the radius of the finished circle's diameter which included the seam allowance. I stuck the pin into the ribbon and the center of the cardboard and attached the ribbon to the marker with blue painter's tape, then drew a perfect circle on the cardboard. The template allowed me to use a rotary cutter and cut several pieces of fabric at one time, a true time saver when having to cut 28 large circles. Here is the link to create your own pillow. Please share your pillow pictures with us. Sitting at the driver's seat for the first time behind the wheel of a sewing machine can be pretty daunting. It is a real electrical running machine that seems to have a mind of its own when you put your foot on the pedal. The motor runs so fast and the wheel starts turning so quickly you cannot even see it turning, then the fabric begins to pull uncontrollably under the feed dogs. With haste, you must gain composure and take control by placing your hands in the correct position and adjust the foot pedal speed to just the right amount - not too fast - not too slow, all while keeping that fabric in the same position on the stitch plate so you end up with a straight seam. A loomed sample of knit on the left and woven ribbon as a sample on the right. The thirteen teens at the Fairfield Woods Branch Library sewing camp did just that - they conquered the sewing machine. They began with all the visual introductions of learning the difference between wovens and knits, types of fabrics, sewing notions, safety, the anatomy of the sewing machine and then hands-on with threading the machine and loading a bobbin. They progressed to practicing on paper using templates from the book, The Best of Sewing Machine Fun for Kids. The paper practice allowed them to learn to keep a straight line as well as pivoting through their paper maze. Now they were ready for their first project. This was the easiest construction project for them, but with respect to the planning, it was the hardest. The library was given a generous donation of gorgeous flannel cuts. That was the challenge - they were curvy cuts - not the ends of bolts or straight cuts - curves. What can you make out of curvy fabric? Got it! Small sized flannel rice heating bags. The flannel was so thick and warm. It was perfect for such a project. The project was made with two rectangles cut 11" by 4". Instead of using a straight stitch they sewed with an imitation serger stitch (as I like to call it) - a straight stitch combined with a zig zag stitch. This combination stitch was to prevent the rice from falling out of the bag (believe me this happens). Once all three sides were sewn, they filled the bag with a half pound of white uncooked rice. It was easy to pour as we had pre-measured the rice and put it in quart size plastic bags. When it was time to fill up the heating bags, they snipped the bottom corners of the bags and poured from the newly created funnel. It worked great - no one spilled their bag of rice. The hard part was keeping the rice at the opposite side from the closure so they could sew up the opening. Success! Everyone had a functional rice heating bag. These bags are so practical and can be molded to fit your body. Put them in a clean microwave for about one minute and the gentle heat lasts about twenty minutes. The next day some of the teens reported them lasting up to an hour. It will vary based upon the strength of your microwave. ~ warmed to soothe an aching neck ~ a book weight ~ a prop for a techy device ~ a smaller square can be used for a toddler's game of hopscotch ~ a large heated bag can be sewn for an old cat to lie on ~ small bags for a toss game ~ even tinier bags for pattern weights ~ a game of tic-tac-toe ~ sewn in a variety of colors for young toddlers ~ juggling ~ etc. How will you use these bags? Well, did you? Did you make your bed today? Now what does that have to do with sewing? That is exactly what thirteen teens thought when I asked them the first morning of their sewing camp at the Fairfield Woods Branch library. Naval Admiral William McRaven, ninth commander of the U.S. Special Operations Command, told thousands of people at the commencement of the University of Texas on May 17, 2015, "Make your bed every day!" To have a navy seal admiral tell you to make your bed is even more alarming than a motherly-type woman at a sewing class. The little things in life do matter. Sewing is the prime example. Everyone wears clothes that were made from thousands, and some millions, of tiny little stitches. We all take them for granted, well unless, you were not wise and pulled that bobbin stitch and the whole seam unraveled. Each teen in the sewing class learned that each stitch mattered. If they went off track, they could see it. They could visibly see when their item had some misaligned seams or if the seam was too tight to allow the elastic to slip through easily and then they had to use their seam rippers to start all over again. It was a lesson well learned. This lesson is important in our day-to-day lives. We must learn to complete the little tasks well so we are ready for the big tasks. So have you made your bed today? Libraries are branching out into different venues, as seen with the “branch” public library of Fairfield, Connecticut, where they offered a free four-day sewing camp during mid July to the patrons of the library who were entering grades 6 – 8. It was an exhilarating four days. I had the privilege to be their instructor for two hours each day, and astonishingly, with almost three hours on the last day for many who willingly came in early to finish their projects from the day before. There were thirteen wonderful teens, who came to have fun creating on the six sewing machines in the library’s sewing studio. It all began back in April, when I was contacted by LinkedIn with a “link” from Volunteermatch.org who thought my credentials would be a good fit – current volunteering and sewing skills. The library had listed their need with that organization. It was a great match. Not only did I volunteer, but three other women volunteered to help with the sewing camp. The sewing class would not have been as successful without all their hard work and that of the two awe-inspiring staff members from the library. They were all invaluable and I am so grateful for them. During the four days, the teens learned how to sew on the sewing machines, all about sewing notions, how to cut fabric, iron seams, sew an elastic waistband, insert a zipper and all the other skills needed to complete four sewn projects. They made a flannel heating pad, cuddle-soft pillow, pajama bottoms, and zippered pencil bag (I will show you each project in a separate post). That is an incredible amount to learn in just eight to nine hours. They all just soaked up all those skills so quickly and just kept up with the fast pace of the class. They were an awesome group of teens! The goal of the four projects was to use existing fabric – you know what I mean – their stash. Even the library had a fabric stash. Who would have guessed! This goal is what drove the specific projects so that the class could be offered at no charge to the students. The library did purchase a few items, but nothing over their budget, and the students were requested to bring in a 16 ounce bag of polyfil for their pillow projects. That was quite a feat – four great projects for just the cost of some polyfil that I hope they purchased with a 50% off coupon at their local chain sewing store. We did not use a purchased curriculum, but I designed one specifically around the four projects. If you are interested in setting up a sewing camp for your library or another organization, please contact me and I will send you the proposal and the sewing manual. Thank you Fairfield Woods Branch Library for a wonderful four days. I will never forget each one of the teens that greeted me each morning with eager smiles on their face. What do Sewing and a Public Library Have in Common?